Christie’s Hong Kong Magnificent Jewels Autumn Sale will be held at Hall 3 of the Hong Kong Convention and Exhibition Center on November 25, 2014, beginning at 1.30 p.m. The sale features over 300 lots ranging in estimate from US$1,500 to US$7.5 million. A spectacular array of jewels will be featured at the auctions that includes top quality colored and colorless diamonds; colored gemstones such as blue sapphires from Kashmir and Ceylon, pigeon’s blood rubies from Burma, Colombian emeralds, impressive green jadeites and natural pearls. The sale also includes several signed jewels from leading jewelry houses and designers such as Cartier, Van Cleef & Arpels, Bulgari and Bucellati. Two exceptional colored diamond lots by Moussaieff Jewelers feature prominently at the sale and are among the top lots at the sale. Based on the pre-sale estimates, the auction will be led by a Magnificent Diamond Pendant Necklace with the highest estimate of HK$38 – 58 million (US$4.9-7.5 million). The centerpiece of this necklace is a 50.62-carat, marquise-cut, D-color, VVS2-clarity, Type IIa diamond with a stylized surmount consisting of two smaller marquise-cut diamonds placed vertically one below the other and surrounded by smaller brilliant-cut diamonds, suspended from a 18k white-gold double-strand neckchain, accented by collet-set marquise and brilliant-cut diamonds. GIA certificate No. 1142327773 dated 25 SEPTEMBER 2014, certifies the above characteristics and a working diagram accompanying the certificate indicates that the diamond is potentially flawless. The next highlight of the sale with the second highest pre-sale estimate of HK$35.5-50.0 million (US$4.6-6.5 million) is a Moussaieff Jewel assigned Lot No. 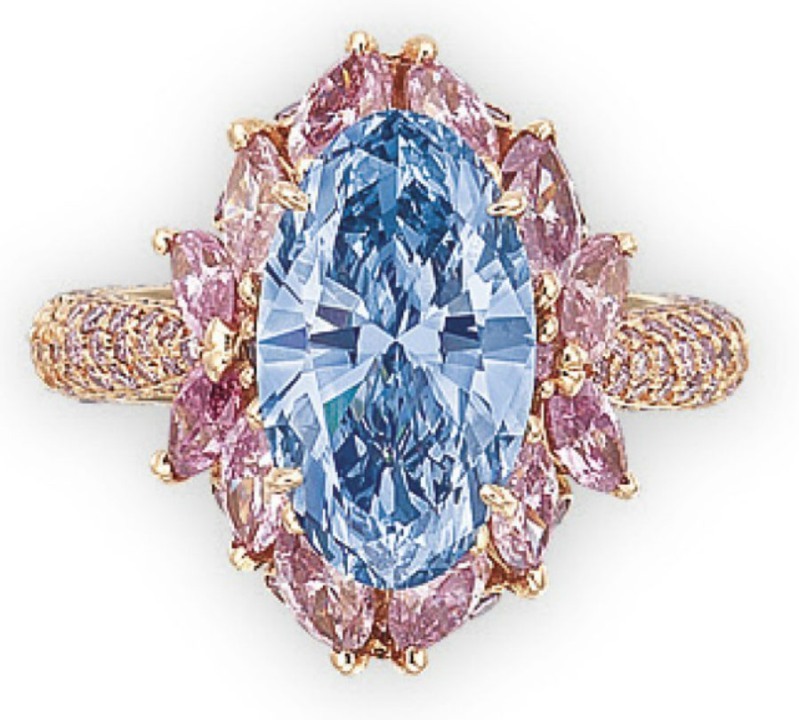 2102 and titled “An Exceptional Colored Diamond Ring by Moussaieff.” The centerpiece of this ring is an oval-shaped, fancy vivid blue, internally flawless diamond weighing 3.39 carats, highlighted by a marquise and brilliant-cut pink diamond surround. Three-quarters of the hoop of the ring is also set with brilliant-cut pink diamonds. The diamonds are mounted in 18k rose gold. GIA certifies that the 3.39-carat oval-cut diamond is fancy vivid bue, natural color, with excellent polish. The lot with the 3rd-highest pre-sale estimate is also a creation of Moussaieff jewelers. The lot assigned No.2103 is titled “A Stunning Colored Diamond and Diamond Ring by Moussaieff” and has a pre-sale estimate of HK$28-38 million (US$3.6-4.9 million) placed on it. The 18k white-gold ring designed as a flowerhead has a heart-shaped, fancy-red, SI2-clarity diamond weighing 2.09 carats set as its centerpiece, surrounded by six petals, each set with a pear-shaped colorless diamond varying from 1.01 to 1.07 carats. The space between the pear-shaped diamonds is accented with brilliant-cut diamonds and so is the three-quarter hoop of the ring. GIA certificate No. 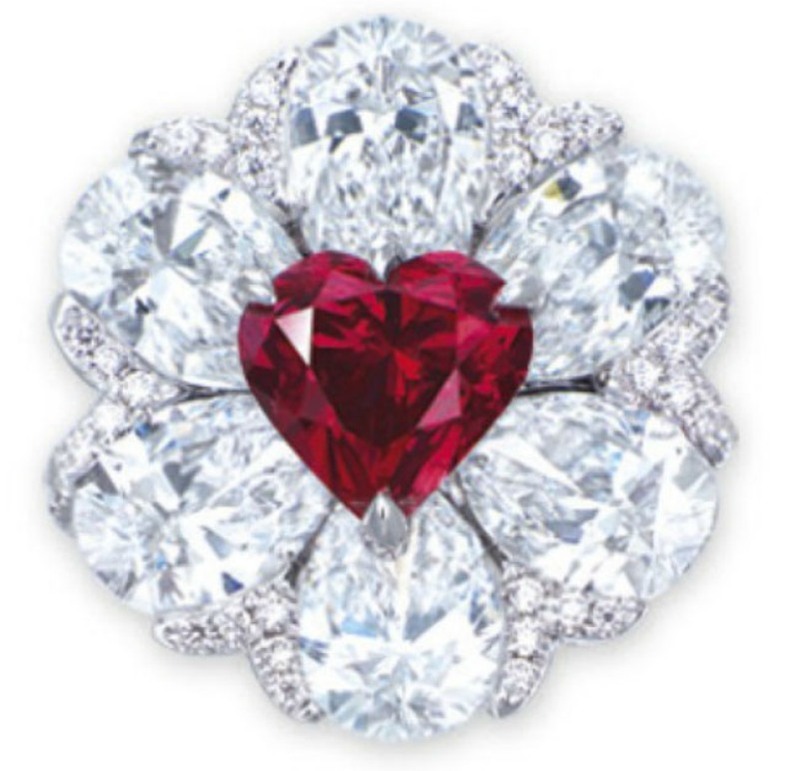 2115511169 DATED 17 DECEMBER 2009, certifies that the 2.09-carat, heart-shaped diamond, is fancy red, natural-color and SI2-clarity. Six additional reports by GIA dated from May 5, 2014 to August 16, 2014 certify that the pear-shaped diamonds weighing from 1.01 to 1.07 carats are D-color and Internally Flawless clarity. Other prominent colored diamond lots include Lots 2100 and 2097. Lot 2100 is A Rare Pair of Colored Diamond and Diamond Ear Pendants with a pre-sale estimate of HK$24-40 million (US$3.1-5.2 million). 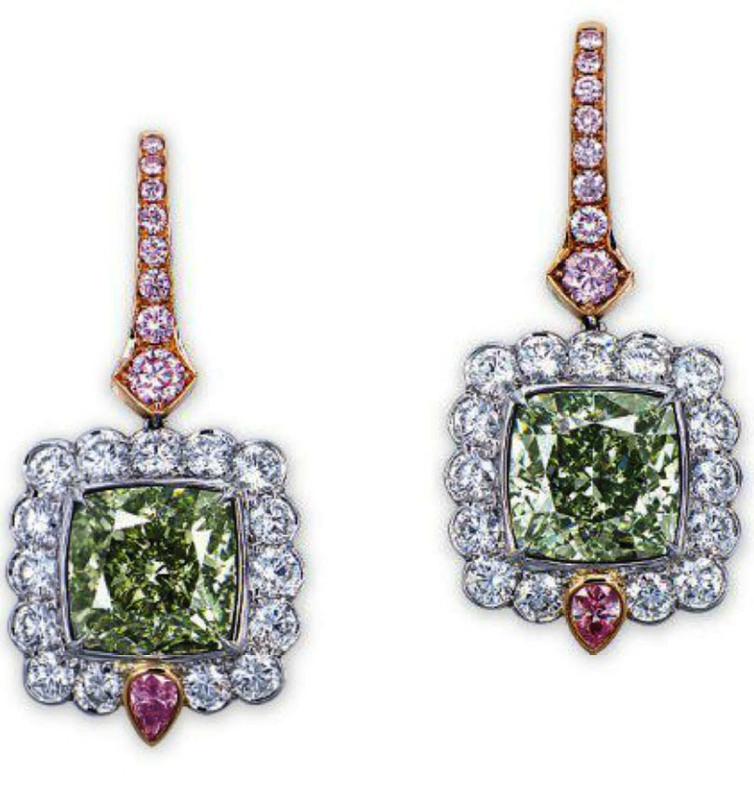 The 3.5 cm long ear pendants are set with a matching pair of square-shaped natural green diamonds weighing 5.64 carats and 5.18 carats, highlighted by a brilliant-cut, colorless diamond surround, accented by a pear-shaped pink diamond at the bottom. While the 5.64-carat green diamond has a color-grade of fancy-intense green, the 5.18-carat green diamond has a color-grade of fancy-intense yellowish-green. The hooks suspending the ear-pendants are also mounted with brilliant-cut pink diamonds. The diamonds are mounted in platinum and 18k rose-gold.Two GIA reports accompanying the lot certify that the 5.64-carat diamond is fancy-intense green, natural color, SI2-clarity, with excellent polish and the 5.18-carat diamond is fancy-intense yellowish-green, natural color, SI1-clarity, with excellent polish. Lot 2097 – A Unique Belle Epoque Colored Diamond and Diamond Pendant Necklace – has a pre-sale estimate of HK$12-18 million (US$1.5-2.3 million) placed on it. 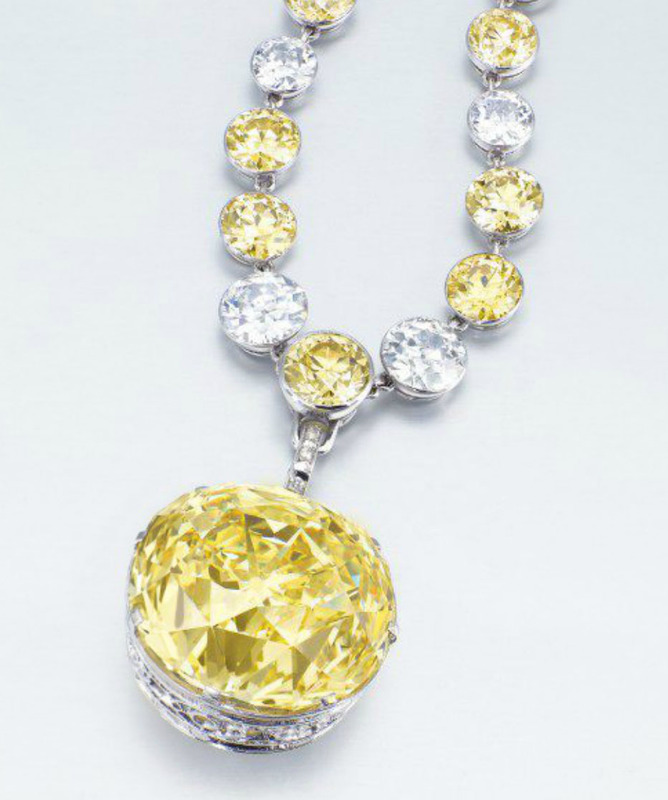 The pendant is set with a 52.26-carat, cushion-shaped, fancy-intense yellow diamond suspended from a collet-set Old-European and Brilliant-cut colorless diamond and yellow diamond neckchain, 51 cm long. 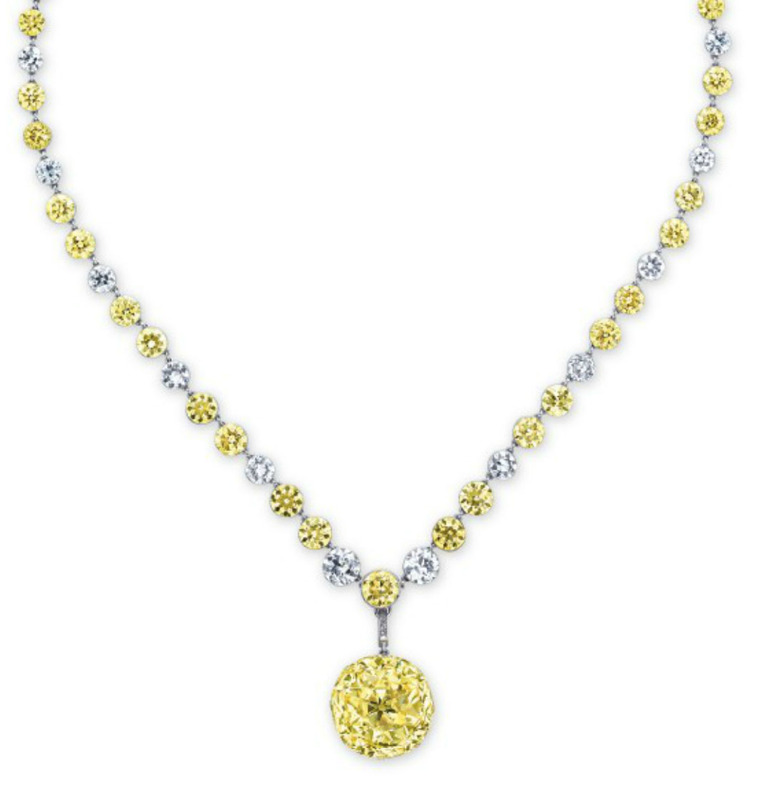 The front of the neckchain is set with a brilliant-cut fancy-vivid yellow diamond weighing 1.33 carats from which the pendant is suspended and two Old-European cut colorless diamonds on either side. In the neckchain itself a single collet-set colorless diamond is placed after every two collet-set yellow diamonds. The diamonds are mounted on platinum. GIA certifies that the 52.26-carat diamond is fancy-intense yellow with a VS1 clarity grade and a cushion-cut that is improvable. Colored gemstone lots will be led by Lot 2078 – A Magnificent Pair of Jadeite and DIamond Ear Studs with a pre-sale estimate of HK$28-38 million (US$3.6-4.9 million). 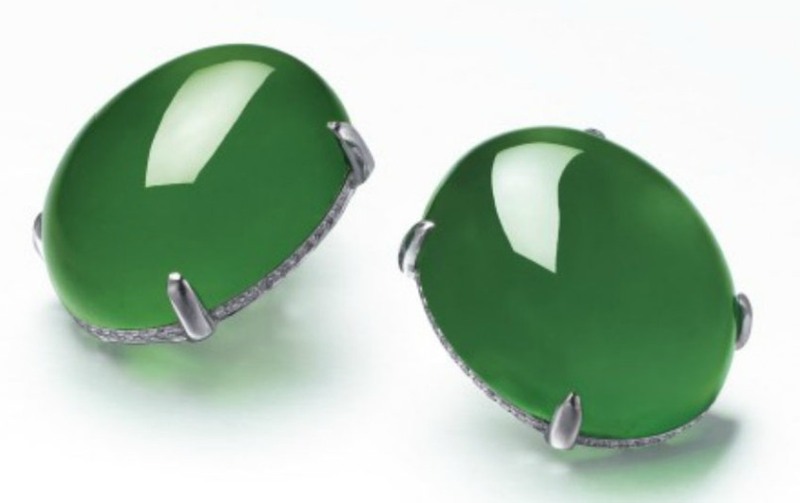 Each stud is set with a thick high-domed jadeite cabochon of very even brilliant emerald-green color and high translucency, with a brilliant-cut diamond gallery, the back enhanced by diamond-set scrolls, mounted in 18k white gold. The Hong Kong Jade & Stone Laboratory certifies that the cabochons are natural jadeite with no polymer detected. Another colored gemstone highlight of the sale is Lot 2063 A – A Rare Sapphire and Diamond Ring with a pre-sale estimate of HK$22-30 million (US$2.8-3.9 million). 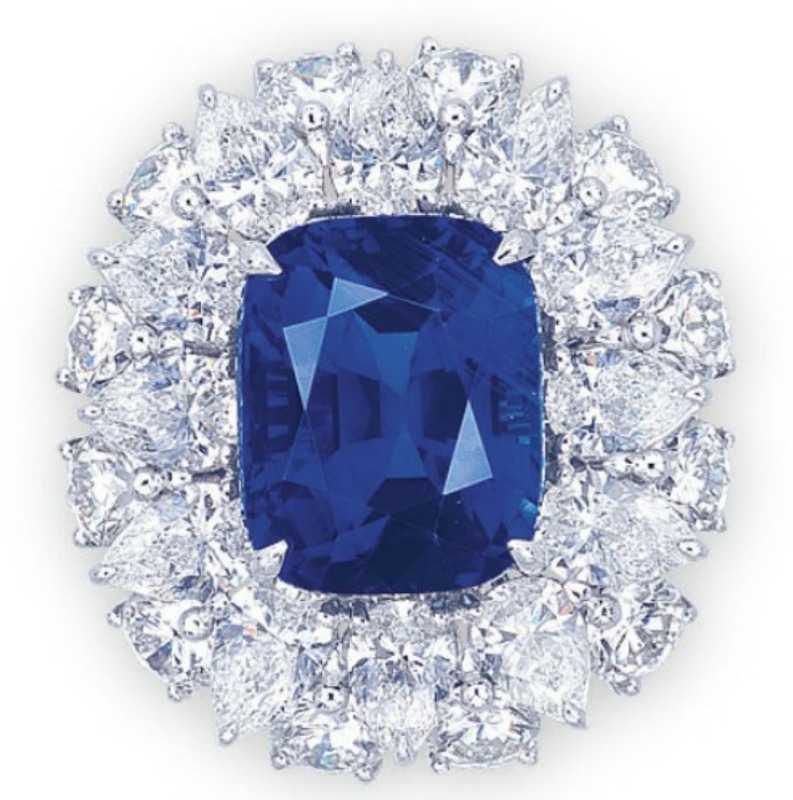 The centerpiece of this ring is a rare, 19.36-carat, cushion-cut Kashmir blue sapphire, within a pear-cut and brilliant-cut two-tiered colorless diamond surround, joined to the brilliant-cut diamond bifurcated half-hoop, mounted in platinum. Three lab reports by SSEF, AGL and GGL certify the Kashmir origin of the blue sapphire with no indications of heating, and speaks highly of the combination of outstanding characteristics in the sapphire such as a remarkabe size and weight for a Kashmir sapphire; a saturated homogenous blue color; excellent clarity with a high degree of transparency and well-proportioned cut. 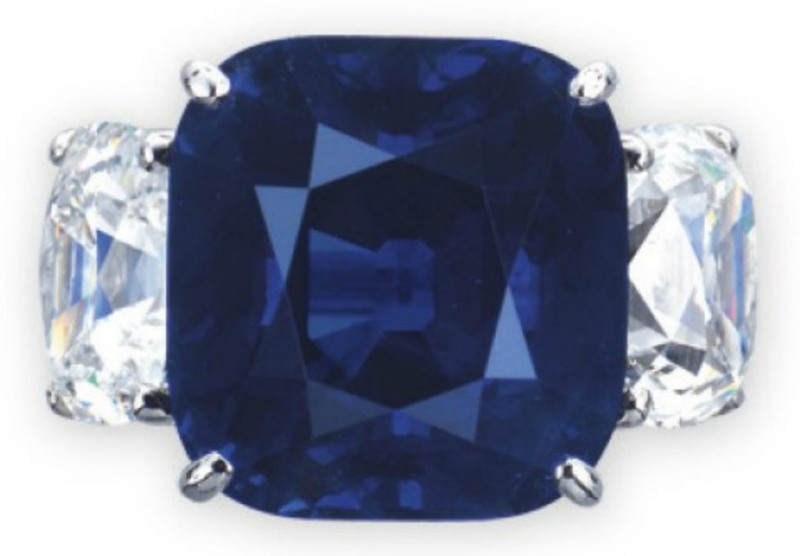 Other blue sapphire lots are lot 2063, lot 2061, lot 2046 and lot 2062. 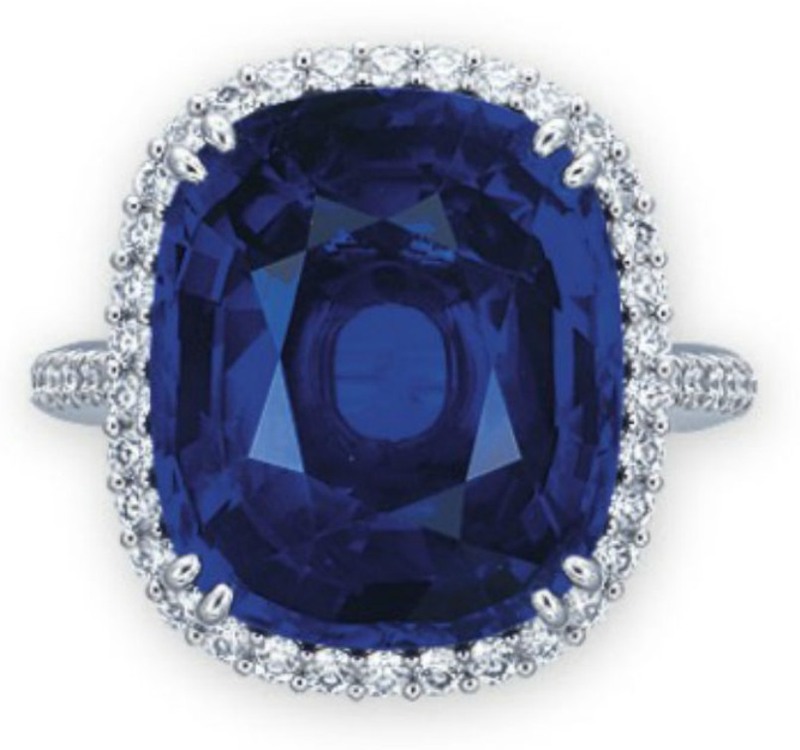 Lot 2063 – An Important Sapphire and Diamond Ring – Set with a 11.64-carat, cushion-cut Kashmir sapphire, fanked by half-moon diamonds, mounted in 18k white-gold. Estimate HK$9.5-12.0 million (US$1.2-1.5 million). 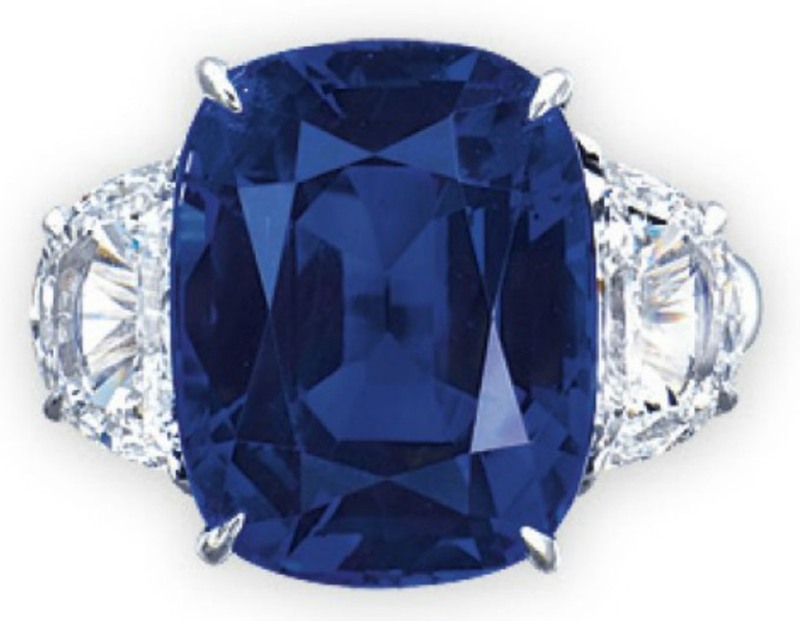 Lot 2046 – A Sapphire and Diamond Ring by Gimel – Set with a 17.10-carat, cushion-cut, Burma blue sapphire with a brilliant-cut diamond surround, mounted in platinum. Estimate HK$6.5-9.5 million (US$800,000 – 1,200,000). Lot 2062 – A Magnificent Sapphire and Diamond Pendant Necklace by Chatila. 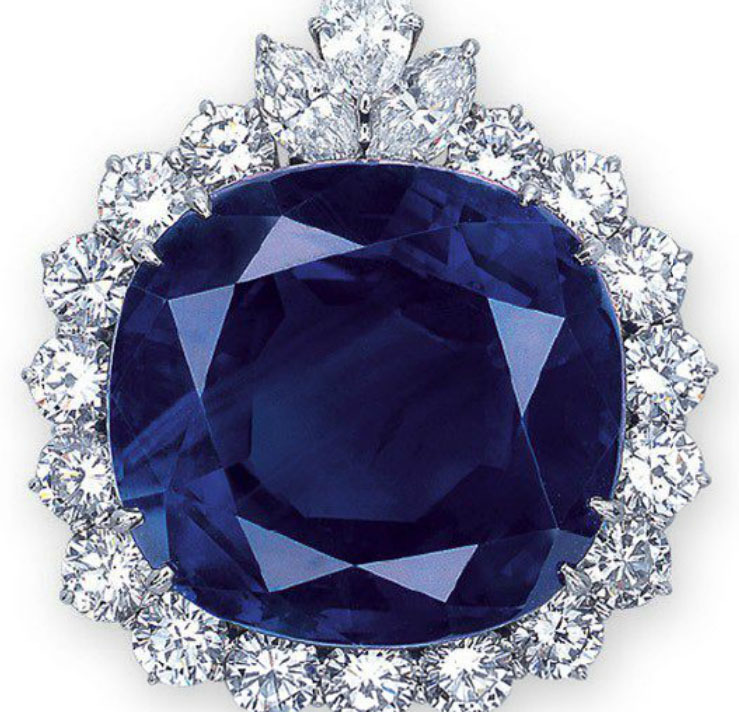 Pendant set with a 101.32-carat, cushion-cut, Ceylon sapphire highlighted by a briliant and marquise-cut colorless diamond surround. Estimate HK$4.8-6.5 million (US$600,000-850,000). Lots containing Burma Pigeon’s blood ruby are highlighted by Lot 2066 and Lot 2067. 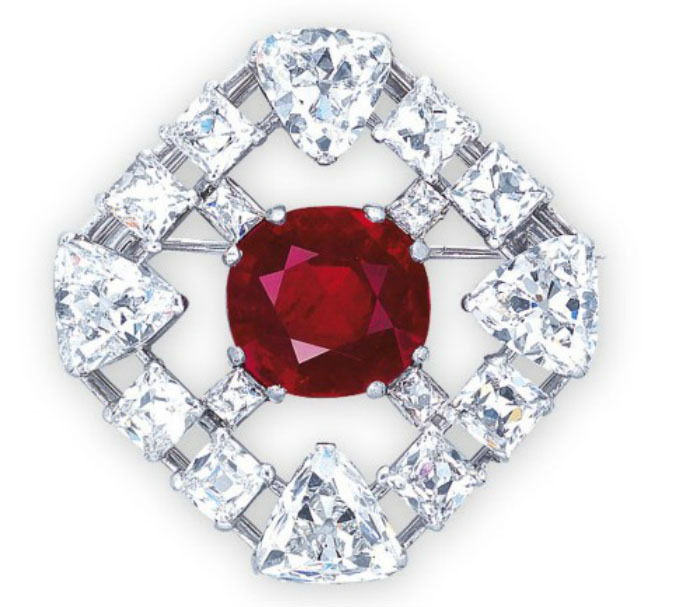 Lot 2066 – An Extremely Rare Ruby and Diamond Brooch – by Cartier – is set with a 10.10-carat, cushion-cut ruby within an openwork octagonal plaque, set with square and rectangular shaped diamonds accented by triangular shaped diamond quarters mounted in platinum. Estimate HK$20-30 million (US$2.6-3.9 million). 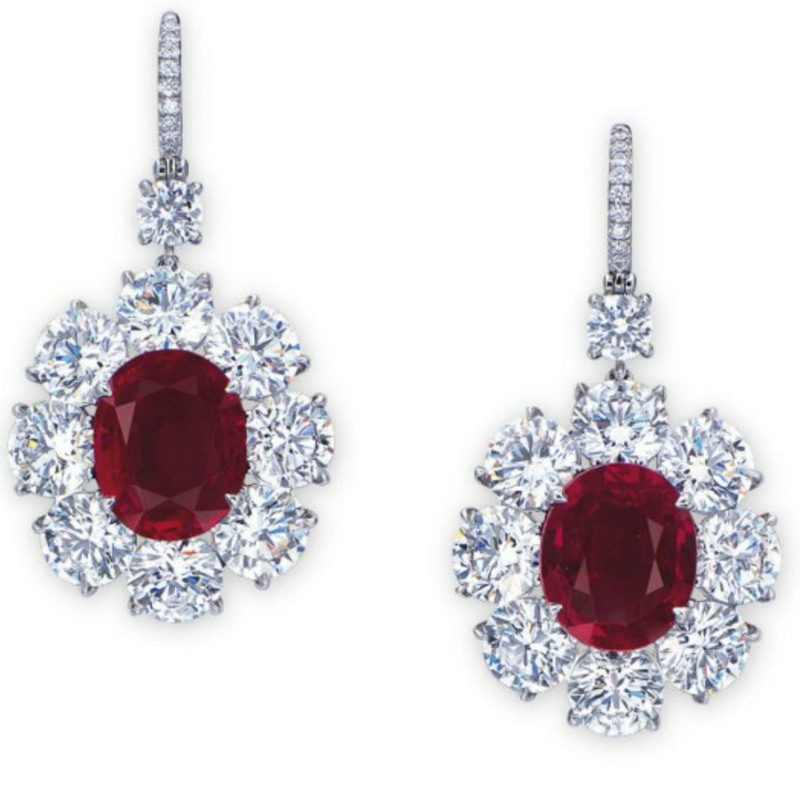 Lot 2067 – A Superb Pair of Ruby and Diamond Ear Pendants – Each set with an oval-shaped Burma ruby weighing 4.25 and 4.18 carats within a briliant-cut diamond surround, with a brilliant-cut diamond surmount and hook, mounted in platinum and 3.7 cm. long. Estimate HK$20-30 million (US$2.6-3.9 million). 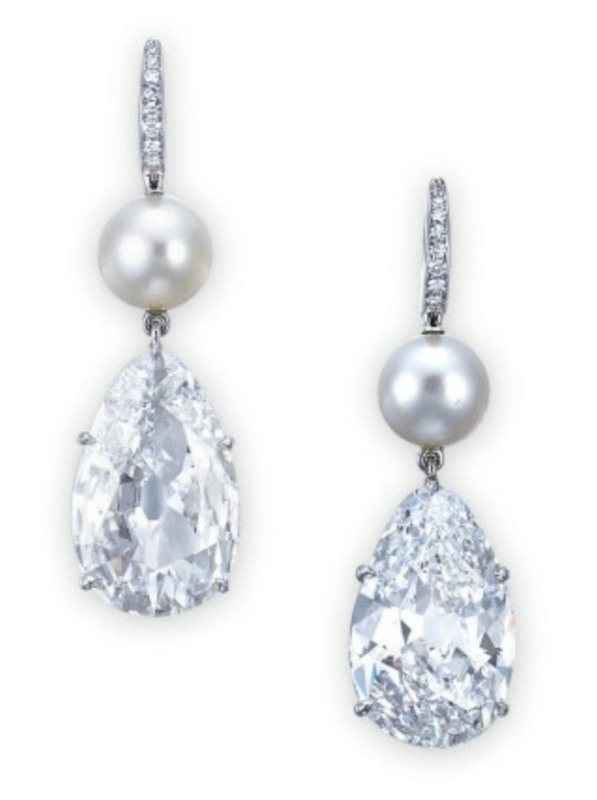 Lots 2089 and 2090 are lots incorporating natural pearls. 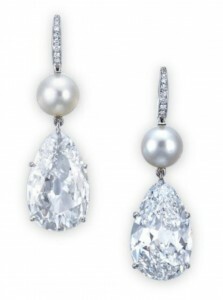 Lot 2089 – An Attractive Pair of Diamond and Natural Pearl Ear Pendants – Each set with a pear-shaped diamond weighing 9.07 and 8.08 carats, surmounted by a natural cream button pearl with dimensions of 8.1 x 6.7 mm and 8.2 x 7.3 mm, with a single-cut diamond hook, mounted in platinum and 4.1 cm long. Estimate HK$17-25 million (US$2.2-3.2 million). Lot 2090 – An Exquisite Natural Colored Pearl, Ruby and Diamond Pendant Necklace – The 69.6 cm long necklace is made of a single-strand of round and offround brown and grey natural pearls, with diameter varying between 5.5 and 7.8 mm. 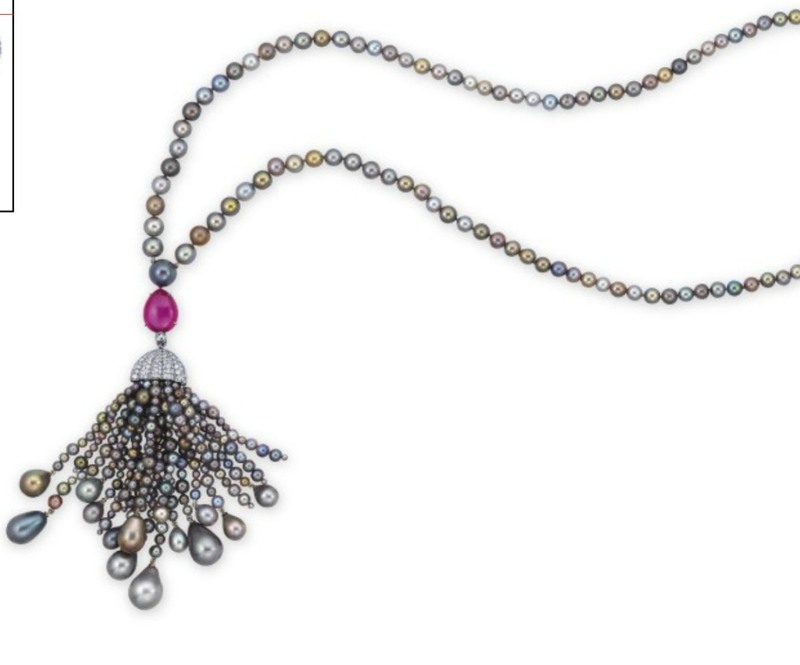 The centerpiece of this necklace is a large natural grey button pearl with diameter 10.2 mm from which a tassel of round and off-round brown and grey natural pearls is suspended. Each tassel ends with a large natural pearl drop varying in dimensions from 8.3 x 7.2 mm to 17.5 x 12.3 mm. The tassels originate from a brilliant-cut diamond cap which is connected to the centerpiece of the necklace via a 13.54carat cabochon ruby. The clasp is made of three larger button pearls, each with a diamond surround, mounted in platinum. Estimate HK$16-25 million (US$2.1-3.2 million).